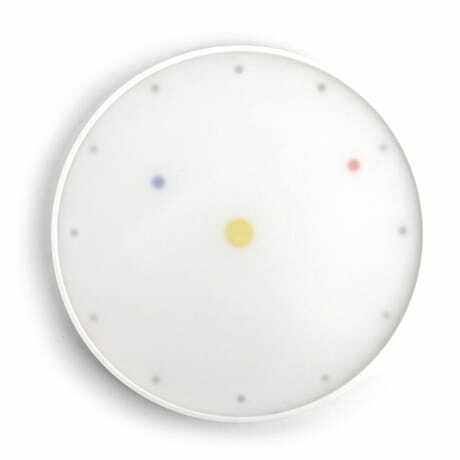 Like little planets around a tiny sun, the hours and minutes orbit Milton Glaser's all-white clock as dots of color, awash in a somewhat hazy ether. The frosted plastic across the face gives the whole clock a soft focus, emphasizing the idea that time can be a bit fuzzy around the edges. The creator of such iconic imagery as the "I heart NY" logo and the "Dylan" poster with Bob Dylan's silhouette and psychedelic hair, Glaser has also designed elegant, playful interpretations of timepieces. The Reductous Clock is intended to be not so much an accurate instrument as a visual accompaniment to the passage of time. Measuring 10 inches in diameter and a barely over half an inch thick, it is presented in minimal yet attractive cardboard packaging, and includes a battery and a short, stout nail for hanging the clock on the wall.